Don’t let nebulous ideas slow you down as you count down to this October’s World Space Week. 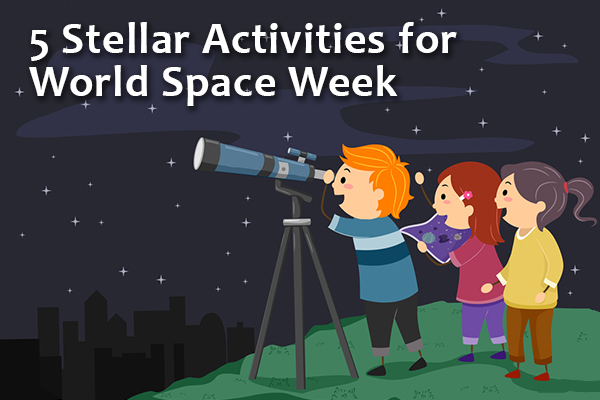 Rather, shoot for the moon with these astronomical activities for celebrating World Space Week with your class or family. Take this week to celebrate global cooperation in the near reaches of space by learning about the International Space Station (ISS). Check out the view from the space station. Get kids outside on a clear evening to look for the space station passing overhead. Visit NASA’s Spot The Station site to find when to view the ISS from your location. Screen a few of NASA’s Human Research Program videos with your students or read about Sleeping on the Space Station with this worksheet. The Red Planet continues to capture headlines and our imaginations. Take advantage of student interest in our planetary neighbor by exploring what we know about Mars. Have students participate in the Planet Four: Terrains citizen science project by examining and mapping images of Mars. Control a virtual rover with Experience Curiosity. Find more Mars-related games and activities at NASA’s Mars Exploration site and try our reading passages, Earth vs. Mars and One-Way Ticket to Mars. The Apollo days have pasted, but the Moon is likely to soon be a stepping stone for human missions to Mars. Read about Moon exploration plans, then launch into a Moon unit. No need to don a spacesuit, rather bring a piece of the Moon to your classroom with the Lunar and Meteorite Sample Disk Program. Educator’s must be located in the United States and go through a certification process, but the effort will be well worth it! Kick off your unit with this Moon Surface Features lesson and navigate the surface with Google Moon. Finally, decelerate by watching a sci-fi movie! Perhaps your high school students will enjoy the interplanetary adventure The Martian. If you have access to a telescope, World Space Week is a great time to use it! Students may not have ever had the opportunity to actually observe planets, stars, or the Moon up-close through a telescope. If your school has a telescope, plan an viewing party with students and families. If you don’t have access to a telescope, some libraries offer telescope lending or viewing opportunities. Likewise, many observatories offer public viewing options and accommodate student field trips. To find a local observatory, check with nearby universities or try one of these publicly accessible telescopes. If you’re still in need of fun ways to celebrate World Space Week, sojourn to the World Space Week website and download one of the educator resource guides or locate a nearby event for more out of this world activities! Looking for additional space science education resources? Visit HelpTeaching.com and try our astronomy printables and lessons. November 15 is America Recycles Day. According to the U.S. Environmental Protection Agency (EPA), Americans recycled about 34% of their trash in 2014. The good news is this is a significant increase over the less than 10% that was recycled in 1980. The bad news is that a lot of our garbage still isn’t being recycled. Although we have come a long way in our recycling practices, we still have a long way to go. America Recycles Day is an opportunity to educate students about the importance of recycling, and more importantly, involve them in the process. 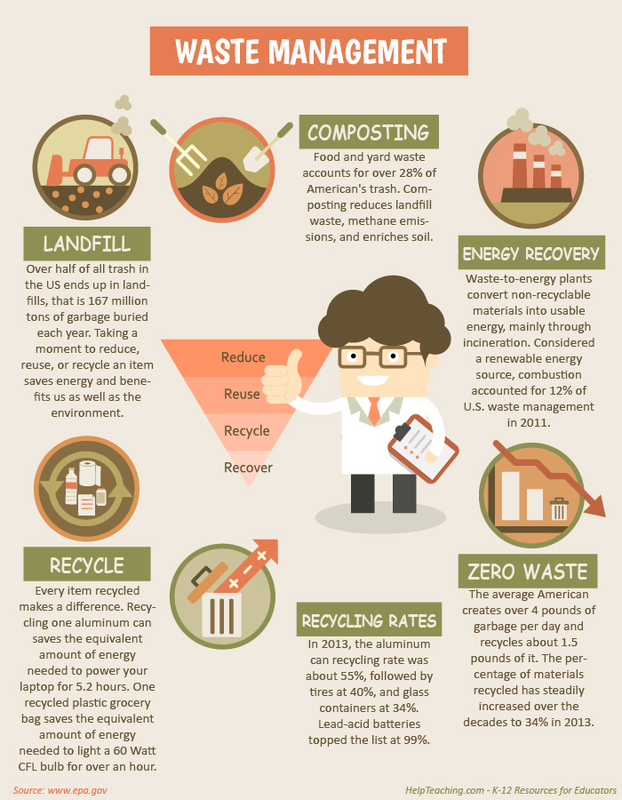 Ask your students to research recycling facts and statistics, then create infographics based on their findings. Younger students can get creative and make poster infographics to display around school. Older students can craft digital infographics to post on school websites, classroom blogs, or social media. Get started by assigning HelpTeaching’s lessons, Reduce, Reuse, Recycle and The Trash Patrol, then by visiting the EPA’s Reduce, Reuse, Recycle website. Then use an infographic maker like Visme or Piktochart to present them. Below is a sample infographic for a reference. Bottle and can drives are great ways to encourage recycling and raise awareness, plus they double as fundraisers for schools and organizations. Students can help organize the event by contacting the local recycling center ahead of time, spreading the word in your community, sorting on the day of the drive, and arranging for collection bins and transportation of collected materials to the recycling center. For another simple and profitable way to encourage recycling, set up an ink cartridge recycling program at your school. 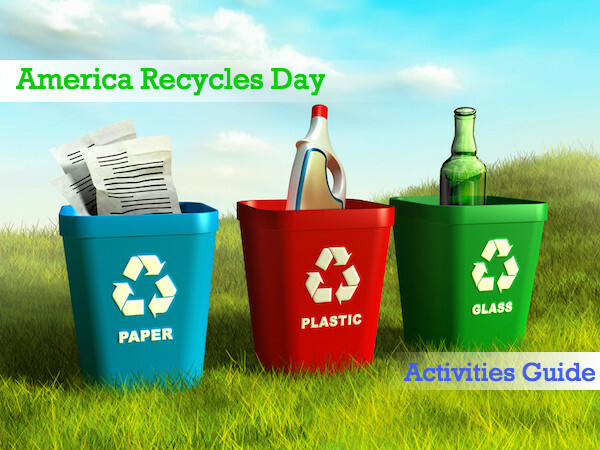 Whether you are looking to get your children involved in a recycling event, enter a contest, or participate in a community clean up day, you can find something to do on America Recycles Day. There are over 2,000 events registered for America Recycles Day. Find one to attend in your area here. With the approach of Thanksgiving, America Recycles Day is perfectly timed to encourage children to reduce food waste. Learn about composting or start a compost at home or school. Have students create a step-by-step plan to explain how they plan to reduce food waste at home. Better yet, have your students organize a food rescue program or donations for the local food pantry. Get started with these tips. If you plan on having your students create crafts for holiday decorations or gifts, then consider having them do so using materials that would otherwise be tossed out. Here is an excellent list of recycled crafts for kids. Also, use this writing prompt for eco-friendly gift ideas. E-waste is an ever growing concern and electronic items should never go in your daily recycling container. But, your students’ old phones, tablets, and MP3 players can help someone else. Encourage students to donate unwanted electronics for worthy causes. Shelter Alliance and Cell Phones for Soldiers are just a couple organizations that accept cell phones donations. Learn more about how and where to recycle and donate electronics here. According to the EPA, almost five percent of municipal solid waste comes from clothing, footwear, and textiles. Consider organizing a neighborhood or church clothing swap where children (and adults!) can bring clean, gently worn items and swap for “new” items that fit. Anything left over can be donated to local organizations like The Salvation Army or Dress for Success. Also, see about coordinating swap boxes with local sports leagues for common sports items that children outgrow, like cleats. Athletes can leave outgrown pairs of cleats and in turn, take a pair from the box that fits. Over 60% of America’s garbage isn’t being recycled. Some people still don’t understand the importance of recycling. Others don’t realize how much of their trash is actually recyclable. Encourage your students to inform people about the importance of recycling. Write letters to the editor of the local newspaper, give speeches at city council meetings, or create pamphlets to give out to their neighbors. Encourage people to check with their local recycling provider to make sure they are following correct recycling guidelines. Finally, and most importantly, ask your students to brainstorm ideas on how to best promote recycling in their school and community. Their excitement for the projects they develop, plan, and complete will be the most successful and rewarding activities! Looking for more science activities for your students? 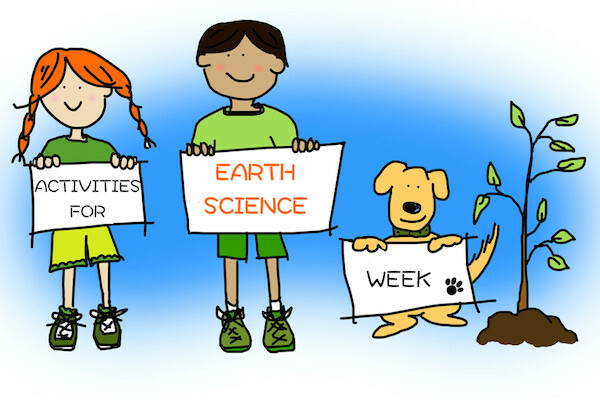 Read 10 Engaging Earth Day Activities for Kids or try our free Earth Science worksheets and lessons.